Tax season is upon us. While we all dread doing our taxes, for many Americans there is a light at the end of that dark tunnel: a tax refund. Not everyone gets one, and the refund itself is money that you as a taxpayer have technically overpaid during the course of the year. Nonetheless, it feels good to receive that check and many people make big plans for their refund money. Wondering what your tax bill will be? Try SmartAsset’s income tax calculator. So how large are income tax refunds on average? In 2014, the average tax refund in the U.S. was about $2,700. That’s no trivial sum. At the state level, average tax refunds range from a low of $2,254 (in Vermont) up to $3,125 (in Connecticut). To find those numbers, and the average refund in every other state, SmartAsset looked at IRS data on the total number of refunds handed out in every state in 2014 and the total sum of refund dollars. We also compared the average refund in each state to the cost of housing in every state, to determine where that refund goes the furthest. Highest refunds in the tri-state area. Connecticut, New Jersey and New York constitute three of the four states with the highest average tax return. High incomes in this area, which is among the wealthiest in the country, may contribute to large average refunds. The south too. Five southern states rank among the top ten states with the highest refunds. 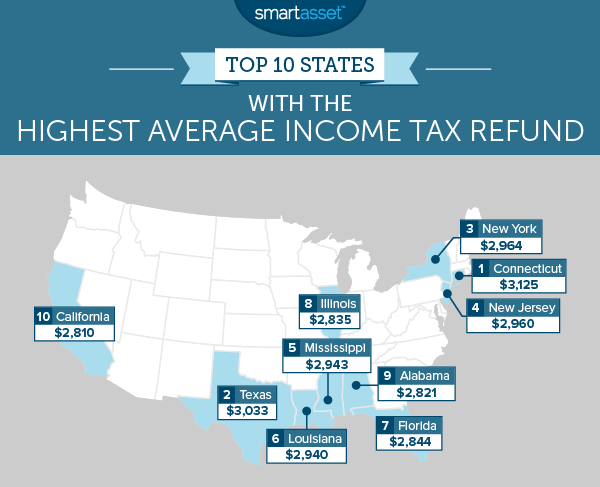 Texas, Mississippi, Louisiana, Florida and Alabama all have average refunds of more than $2,800. Refunds in these states go even further than in the rest of the country, thanks to the lower cost of living. According to the U.S. Census Bureau, the median household income in Connecticut is $70,048, second highest in the U.S. behind Alaska. According to SmartAsset’s Connecticut income tax calculator, a taxpayer earning that level of income could expect to pay $19,484 in federal and state income taxes. So, while $3,125 is a nice chunk of change to be getting back in a refund check, it doesn’t (quite) balance out the whole payment. Texas is one of just two states in which the average tax refund exceeded $3,000 in 2014. Taxpayers in Texas have not only enjoyed higher-than-average federal income tax refunds, they also have no state income taxes to pay. Plus, with a relatively low cost of living in the state, that $3,000 check goes a lot further, covering over three months of housing costs on average. Home to the country’s largest city and many of its wealthiest residents, New York State accounts for a large chunk of IRS revenue – and refunds. According to the IRS, over $22 billion in refunds in 2014. That’s enough to build the Freedom Tower, which cost $3.9 billion, five times. The Garden State is known for its high property taxes and income taxes, but when it comes to refunds Jersey’s taxpayers are cashing in. The average tax refund in the state was $2,960 in 2014. That is equal to about two months of average housing costs in New Jersey. Over one million Mississippians claimed federal income tax refunds in 2014, raking in a total of just over $3 billion. That’s good for an average of $2,943 per person. Thanks to Mississippi’s low cost of living, that money goes further than almost anywhere else in the country, covering four months of average housing costs, with change left over. 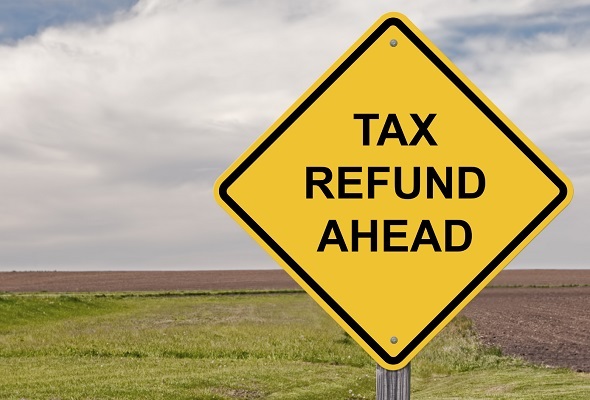 In addition to federal tax refunds, taxpayers in states like Louisiana, which has its own income tax, may also receive a state income tax refund. That means that, on top of the average $2,940 federal tax refund, the overall average refund for Louisianans may be even higher. The state offers several ways for taxpayers to receive their refund, including direct deposit, a paper check or a pre-loaded debit card. The Sunshine State has no state income tax, one reason it’s a top state for retirees. Nonetheless, they still have to pay federal income taxes. In 2014, some 7.4 million tax refunds were handed out to Floridians, worth an average of $2,844. The state with the ninth-highest average tax refund in 2014 was Illinois, where taxpayers who received refunds got an average of $2,835. On a per-capita basis, the average tax return in Illinois was $1,101.23. That’s the fifth-highest refund per person of any U.S. state. Moving to Illinois? Try SmartAsset’s Illinois income tax calculator. Californians received a total of $36.7 billion in tax refunds last year. That is larger than the GDP of roughly half the countries in the world. The average amount refunded was $2,810, enough to cover about two months of housing costs in California, where living expenses are generally higher than average. California also has some of the highest state income tax rates in the U.S.